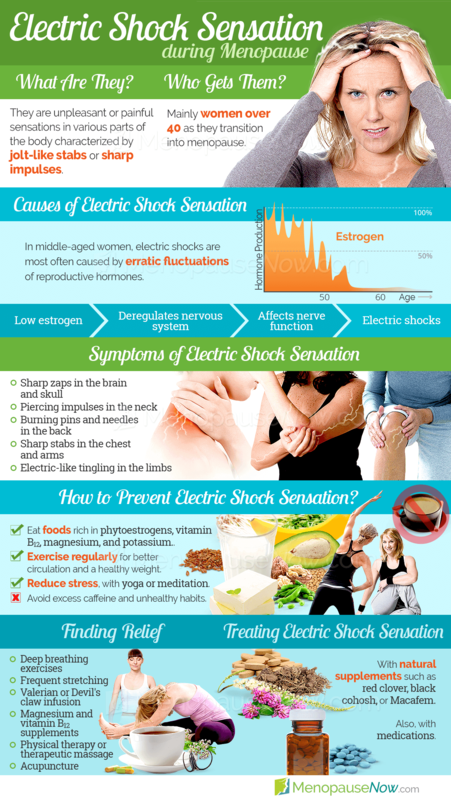 Many women experience electric shock sensations during menopause. These electric shocks can affect the head and the inner layers of the skin. This menopause symptom may occur on its own or it may precede a hot flash, a sudden and intense feeling of heat in the body. While researchers are trying to better understand this menopause symptom, some evidence suggests that sensations of electrical shocks are the result of hormone fluctuations during menopause, as estrogen directly affects the nervous and cardiovascular systems. Read on to discover the definition, symptoms, causes, and treatment options for electric shocks during menopause. Sensations of electric shocks during menopause are often described in the manner shown at the right. These sensations are often brief. 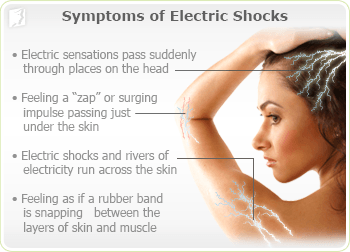 Many women report that electric shocks occur just before a hot flash episode. In order to better understand this strange symptom of menopause, it may help to understand the function of electrical impulses in the body and the effect of menopause-related hormonal changes on the nervous system. In the late 1700s, Italian anatomist Luigi Galvani discovered scientific evidence of a bioelectric force within living tissue. Since this breakthrough discovery, several scientists have proposed theories about electricity in the human body. In modern day, it is known that electrical impulses in the central and peripheral nervous systems are sent from one nerve to another with the help of electrically-charged salts passing through ion channels. Because the body uses electrical impulses as a signalling mechanism, physiological disturbances that occur during menopause can result in abnormal electrical sensations. Read on to learn more about the causes of electric shocks during menopause. It is estimated that 80% of middle-aged women suffer from back pain throughout their life. In some of them, these problems are accompanied by electric-like shocks in several parts of their back. Numerous known causes include disc compression, vitamin deficiency, or hormonal imbalance, most of which can be successfully managed. During menopause, hormonal fluctuations have a direct effect on the nervous system. Changing levels of estrogen - one of the main reproductive hormones whose levels can become unbalanced during menopause - can affect the nerve tissue, potentially causing women to feel sensations of electric shocks. Some researchers postulate that misfiring of the neurons in the nervous system may be responsible for feeling electrical shocks during menopause. Hormone imbalance during menopause can also disturb the hypothalamus in the brain, producing vasomotor symptoms such as hot flashes. Electric shocks in menopause are often experienced as a precursor to hot flash episodes. They might be a rare symptom for some women, but electric shocks in the legs can become a real everyday obstacle.They are experienced in the lower extremities, but in many cases, they originate in the lower back as a result of numerous conditions, such as disc herniation or diabetes. As with all symptoms of menopause, three routes of treatment are available, ranging from lifestyle changes to prescription medicine. Women generally begin with the least aggressive approach to treatment, moving to other approaches only if relief is not achieved through these methods. Lifestyle changes are often the first step in managing menopause symptoms, including electric shocks. While lifestyle changes can produce positive change for women experiencing menopause symptoms, these approaches do not treat the underlying hormonal causes. Fortunately, alternative therapies can directly address the problem of hormonal imbalance safely and effectively, helping to successfully treat electrical shocks during menopause. Many women find a combination of lifestyle changes and alternative medicines are the best way to manage menopause symptoms. Click on the following link to learn specific treatments for electric shocks, which begin with lifestyle changes, move onto alternative medicines, and finally, if those options do not seem to help, medications. The most effective treatments typically combine lifestyle changes and alternative medicines. Many middle-aged women experience electric shocks in the head due to natural hormonal fluctuations, but when they are followed by a headache, the sensation can be very unpleasant. Fortunately, there are several effective ways to prevent and treat it, which include natural hormone stabilizers, controlling triggers, aromatherapy, and many more. 03/19/2019 Muscle spasms that feel like electric shocks are one of the lesser recognized menopause symptoms women can experience throughout mid-life, leaving them wondering exactly what is going on and if they should be worried. Read all about their causes and more here. 11/30/2018 The symptom Lhermitte's sign is not well known by those who don't suffer from it. For menopausal women, not much may be found as to why it occurs and what they can do to resolve it. Continue reading to learn more about Lhermitte's sign, including causes, symptoms, and treatment options. 11/13/2017 Brain zaps can be very disturbing and frightening,especially when experienced for the first time.They are mostly seen in women withdrawing from antidepressants and those with anxiety or multiple sclerosis.Fortunately,they are usually not dangerous and can be treated with supplements,like omega-3- fatty acids, and stress-reducing practices. 10/10/2011 Electric shocks are an uncommon and often frightening side effect of menopause that often strikes right before a hot flash. Click here to learn more about risk factors for electric shock, why electric shock happens to menopausal women, and how this sensation can be treated.